This time last year, this trip was just beginning to be planned and yet now, as I sit and write this, I really am the furthest away from where I thought I would be…but I’m completely okay with it. I should be three months into my working holiday visa in Australia and whilst I enjoyed much of my time Down Under, it just wasn’t particularly what I wanted from this year away - so much so that I’ll probably be sacrificing at least a few months of the trip in order to be where I really want to be. Much of my weekdays are currently spent working as a Marketing Volunteer for Marafiki Community International and Voluntours Adventures. Marafiki Community is an non-governmental organisation who aim to enhance lives through sustainable development. We’ve currently in the process of writing content for a website, creating a Christmas fundraising campaign and coming up with fun social media ideas. It’s my first time being involved working with a charity and it really is great to be able to meet and work with so many kind and incredible people along the way. It’s also been pretty nice to put my brain to use for the first time in six months because, as taxing as it is, the decision on where to eat that day isn't a particular work out for the old noggin and it was feared I could return to the UK with a brain drain all of my own. Whilst brain drain has for now, been prevented, I’ve had this bizarre thing happen to me where I seem to be actually choosing to do real life exercise as a real life fun activity. 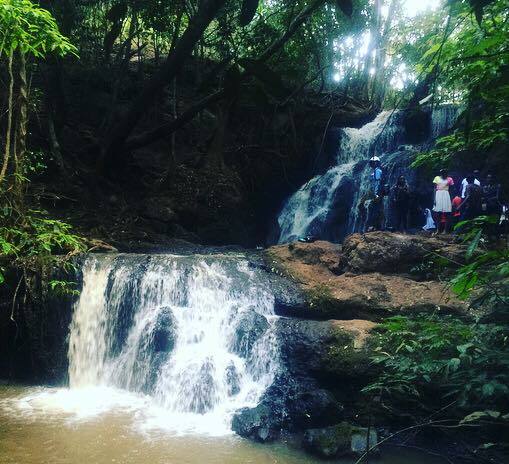 After spending most of the week in front of a laptop screen, we decided to head to the Karura forest and hike to the waterfall. Now, navigating yourself around Kenya generally, is not the most straight forward at the best of times however you really can get yourself into a pickle when none of you fully know exactly which matatu to get from the bustling city centre. After a 2 hour walk around the inner city, 2 bus journeys and what was practically a pre-hike to the forest itself, it’s fair to say an ice cold full fat coke would’ve gone down an absolute treat…instead we were met with the beginning of the trail. 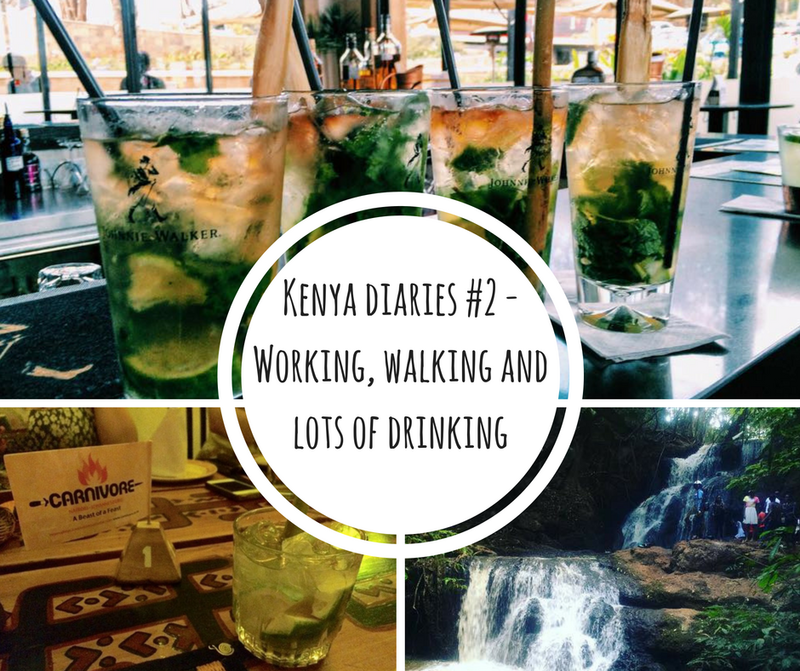 We walked some, and moaned some, and walked a little longer and moaned a little louder until we reached the opening in the trees and were met by the stunning Karura waterfall. It’s safe to say it was worth it and hey, it’s the first time I’ve completed a hike without alcohol at the end so y’know, progress. 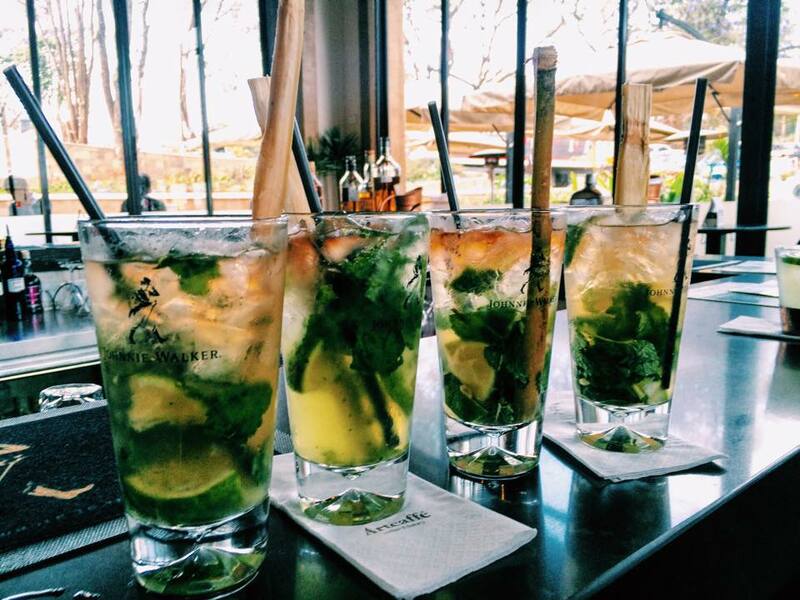 Now, you know alcohol is always around the corner at some point in the day week, and Artcaffe are really treating us well with their daily cocktail happy hours at the moment. Perhaps my favourite though, was the local classic, the ‘Dawa’ - a vodka cocktail which we first tried at the infamous restaurant, Carnivore, by Doctor Dawa himself. If you find yourself in Kenya, and happen to be a fan of meat, you absolutely have to get yourself to this all you can eat meat feast. At a set price of $30 (yay Brexit for continuing to make the pound/dollar conversion rate actually almost painful), you are served meat until you wave a white flag and surrender. From chicken legs and sausages, to ostrich meatballs and bull testicle, it certainly is an experience and one your tummy will not forget in a hurry. Of course, I simply can’t write this post merely days after the US election results and not mention the T word. I woke up to the news that Donald Trump was in the lead to be elected President on the Kenyan coast with Rosie and our two American friends. The feeling was similar to the morning we left the EU but somehow, despite Brexit being for life, this felt worse. I was a supporter of Hillary Clinton and no, not just because she was a woman. Having read a lot of negative articles about her earlier in the year, I decided to find out more about the actual work she has done, instead of constantly reading about emails and her husband’s affair and more emails. I read a book about her work as Secretary of State, I read articles about her policies if she were to become President, I read blog posts about the terrible mistakes she has made along the way. I read all this and came to the conclusion that, whilst in her thirty year long career she made many a mistake along the way, the fact she was having to even stand alongside Donald Trump as her rival candidate was a disgrace. I am hopeful though. Because you have to be, because you have to remember that for the most part, people are good. People are kind. It just wasn't meant to be for Hillary Clinton, but one day, a woman out there will take to the stage as President of the USA and will have broken the hardest, thickest, most challenging glass ceiling that there is to break.